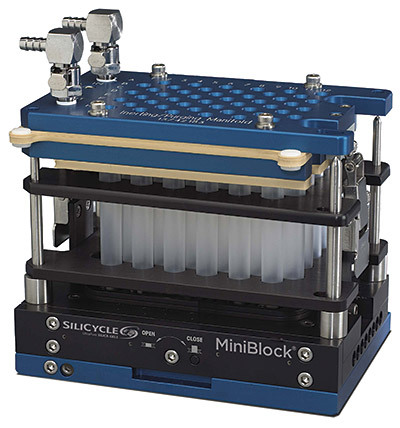 Take our interactive form and find the SiliCycle MiniBlock XT kit that matches your needs! Are you doing solution-phase synthesis or solid-phase synthesis? Do you need filtration or purification during your synthesis? Do you have a recirculator in the lab? Do you need reflux, inerting or evaporating for your chemistry? 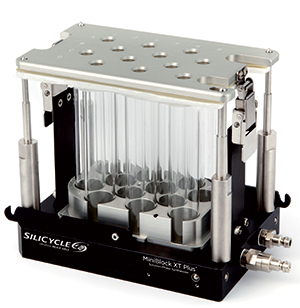 Do you have a round-top heat plate stirrer in the lab? 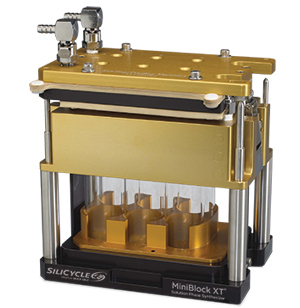 SiliCycle MiniBlock is the only compact parallel synthesizer allowing solid-phase synthesis as well as purification to be carried out on the same platform. The XT-Plus reaction block allows temperature control using a standard heating and cooling recirculator, directly plugged to the XT-Plus frame (no need to use a hotplate stirrer). The Complete Kit comes with a reflux layer and an inert manifold. Available in 6-Positions (110 mL), 12-Positions (55 mL), 24-Positions (18 mL) and 48-Positions (11.5 mL). For a more uniform temperature between all reaction vessels, we recommend the use of our Insulation Wrap. The XT-Plus reaction block allows temperature control using a standard heating and cooling recirculator, directly plugged to the XT-Plus frame (no need to use a hotplate stirrer). 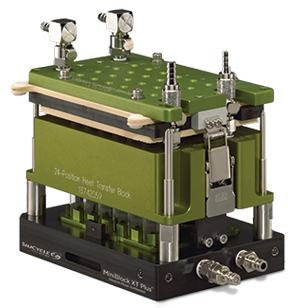 The XT basic reaction block is designed for precision heating and cooling, via a simple hotplate stirrer. The XT Set comes with almost everything you need: a hotplate stirrer, a temperature control kit, a reflux layer and an inert manifold. To ensure a precise sub-ambient temperature control, we recommend the use of the XT Low Temperature Bath (maintains dry ice / acetone temperature for approximately four hours without refilling). 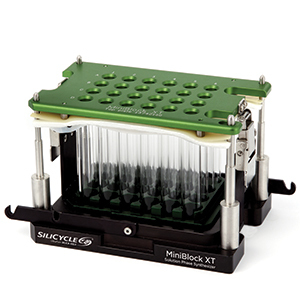 The XT basic reaction block is designed for precision heating and cooling, via a simple hotplate stirrer. The Complete Kit comes with a reflux layer and an inert manifold. For a more effective heating, we recommend the use of our Heat Dispersion Adapter (focuses heat from the stirrer plate unit to the XT reactor) and our Insulation Wrap (for a uniform temperature between all reaction vessels). 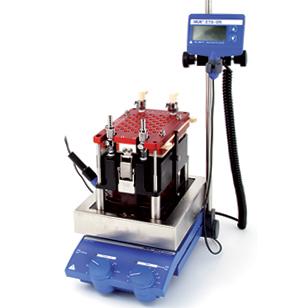 The XT Basic reaction block is designed for precision heating and cooling, via a simple hotplate stirrer.